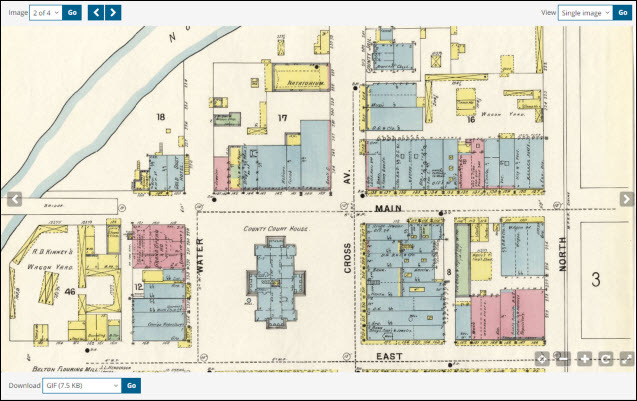 The genealogical community got the first installment of what’s going to be a fabulous gift for research when the Library of Congress announced yesterday that nearly 25,000 Sanborn Fire Insurance maps have gone online and can be accessed free. To which The Legal Genealogist has only one thing to say: Ohboyohboyohboy!!! Take a look, for example, at this snippet of the Sanborn map of Belton, county seat of Bell County, Texas, in the year 1896. You can see, for example, the County Court House between Water and Cross and Main and East. Continue up Cross for another block and you come to the County Jail. Across Cross Avenue from the Courthouse, the business district: the drug store and jeweler, the banks, the hardware store, the dry good. Across Main from the Courthouse, another set of businesses: the notions store, the furniture store, a place selling paints and wallpaper. Also on Main on the far side of Cross Avenue, the fancy goods store, the bakery, the confectioner’s store. In other words, these maps are a thoroughly detailed look at the history of our cities and towns — a way to see where and how our ancestors lived. Want some ideas as to how to use them? Take a gander at the essays “Sanborn Samplers,”5 and Sanborn Time Series,6 also on the site. Need more? Jill Morelli did a terrific webinar for the Legacy Family Webinar series back in April 2016 — “Fire Insurance Maps – The Google Maps of Their Day.” The single digital download is $9.95, but a better deal is to get the whole webinar series by subscription ($9.95 for one month, $49.95 for a year). Now… remember that not all the maps are online yet. If the area you’re interested isn’t on the Library of Congress site yet, look for other options. For example, if you’re in Kansas City, you can access the historical maps for cities and towns in Missouri and Kansas from home with a library card from the Kansas City Public Library. New York City maps are available through the New York Public Library. Maps are a genealogist’s friend for so many reasons, and the details on these Sanborn maps make them our BFFs. As a historic preservation organization we use Sanborn Maps regularly. Not only do they give an idea of what the neighborhood was like, but you can also follow the evolution of a property in an urban place, and how it changed over time. You can see changes by the shape of the building, the building materials (pink for brick, yellow for frame, blue for stone, etc. ), additions, porches, outbuildings. The maps also indicate the number of stories for a building, and other useful information that helps visualize the spaces our ancestors used daily. By the way, Georgia’s Sanborns are not in the initial group digitized by LOC, but many of them are available through the University of Georgia’s digital portal, Galileo. A big “Thank you” to everyone who helped with various map indexing projects that have helped to make it easier to find the wealth of information in these maps. I have seen several instances where a dollar amount has been pencilled in on a specific property, sometimes with a date. Does anyone know what these notations mean? I was wondering if these were records of that property having suffered fire damage. Thanks, Judy for the shout out about the webinar! A couple of things to note: for your Canadian readers, look for the Charles Goad maps. Sanborn, except in rare instances did not operate outside the continental US. You can still see all the Sanborn maps on ProQuest, although they are the b&w edition. LOC is putting the colored maps on line. You may still want to go to your state archive or academic library to see the colored and corrected maps, which I believe offer the most information. Many more are online across the country and some are even geo-referenced.